A septic system requires routine pumping every two to three years, or sooner if there are many occupants in the household. To ensure your septic system functions properly, it’s important to understand how it works. Unlike a public water and sewer system, your septic could stop functioning completely if the wrong materials are flushed into it. Whether you are experienced with septic systems or a new owner with little prior knowledge about system maintenance, we always recommend you start with a septic pumping followed regularly scheduled system maintenance. Routine pumping occurs every two or three years. Homeowners with numerous occupants might request pumping their tanks sooner. It’s better to service the sanitary system more often in this case. At AST, Ltd., we make recommendations by testing the system’s sludge/scum levels. As water passed through the system, small particles of grease, soap, hair, food scraps, etc. will be suspended in the water and eventually clog the waste laterals. Pressure jetting can remove these deposits and restore drain flow. We also unclog mound systems. The purpose of tank baffles is to secure the waste solids which flow from the house. Due to the bacteriological process of breaking down the solids in the tanks, a corrosive gas is emitted that causes corrosion to the areas above the water line in the tank. Damaged outlet baffles cause backups, ponding and reduces the life expectancy of the dispersal zone. The State of Wisconsin requires each County to maintain a log of the sanitary systems in its jurisdiction. Every two or three years, a reminder will be sent to the homeowner to secure a POWTS service provider, like AST, Ltd., to evaluate, pump the sanitary system and report the work performed. Augering is a means of removing blockages and debris from sewer lines. It’s ideal for older systems and tough clogs like rust and scale buildup. Sanitary systems with several tanks may come with risers which allow the manhole cover to be brought to the surface. Periodically, the risers and covers will become cracked and worn causing groundwater infiltration. AST, Ltd. maintains a supply of risers and covers to fit most sanitary systems. These ystems require yearly service and must have a Certified POWTS Maintainer, like AST, Ltd., secured to satisfy State/County inspections and reporting. If you are considering selling or purchasing a home in Wisconsin, a well and sanitary system inspection may be required by the lending institution to secure a loan or complete the sale. Evaluations by licensed professionals will assess the condition of the well and septic system, protect both buyer and seller from unknown issues and unsafe conditions, and prevent health and environmental hazards. Arnolds does not perform real estate transaction inspections of wells or septic systems but we can refer you to a local qualified and experienced inspector to schedule an evaluation. Takes the guesswork out of diagnosing issues. Cameras are used in sewer and drain lines, well casings, chimneys, vent pipes and crawl spaces. Most access restricted areas can be recorded for inspection and repairs. Today most sanitary systems are equipped with filters in lieu of baffles. It works so well that if not periodically cleaned, it can cause a backup much like a clogged pipe. Depending on water usage, filters should be cleaned and inspected every 6–12 months. Some sanitary systems develop internal issues that require confined space entry. Instead of digging up the yard, these pipes can be accessed from inside the tank to auger or pressure jet blockages. Arnold’s maintains a 24/7 Staff Technician on call for any emergency that may arise. Many times, the Technician can assess the situation over the phone and determine if an emergency visit is necessary or can be serviced the following day. Do NOT flush these items down your drain lines. Don’t have time to make a call? We understand. Request our services with our online form. After a service, our certified technicians will then file a county maintenance report. AST, Ltd. always properly disposes of waste in Waste Water Treatment Facilities. Take care of billing and view previous payments, services performed, and upcoming expenses to keep you ahead of the curve. Gathering more info or are you ready to get going?Ready to get going!Gathering some info. Gathering info / Ready to start?Ready to get going!Gathering some info. We offer our services to various locations throughout Southeastern Wisconsin. Failure to maintain a functioning septic/holding tank causes slow draining sinks, toilets, drains. You may also experience a sewage odor near the house and a mushy area near or around the drain field. Alleviate these situations and lengthen the systems proper operating life span by scheduling maintenance. Unsure? Schedule an inspection. When would I know if it's time to schedule maintenance? An accepted practice, developed by the University of Wisconsin is the levels should not exceed 1/3 of the tank volume. I'm a new homeowner / I'm selling my home. Who schedules maintenance? If you are considering selling or purchasing a home in Wisconsin, it is required to secure a well and sanitary system evaluation. This evaluation requires that both systems respectively be brought up to the current Code. The purchaser and or their lending agency will usually request this service. The cost of the testing and evaluation is usually paid by the purchaser but can be negotiated by either party. A thorough evaluation is critical to assess the condition of the water or sanitary system! What are common signs of an ailing system? Customers always ask, “How can I tell if my system needs service or if there is a problem looming?” There are a number of signs an ailing system will display such as; slow draining sinks, toilets, drains. A gurgling sound from a drain when water is being used. A sewage odor when outside or in the house. A soft, mushy area near or around the drain field. A green patch of turf over the drain field. Water noticeable in the vent pipes. As the sanitary system ages, all the above can be noticed at one time or another. With early detection, there are avenues of approach to help alleviate these situations and lengthen the systems proper operating lifespan. What is a mound system? A grease trap will contain animal fats and vegetable oils in kitchen wastewater that flow through your plumbing system before it reaches sanitary sewer lines. If grease is allowed to build up, your lines will become clogged and back up – not a pretty sight or smell! Maintaining grease traps in restaurants or commercial kitchens with heavy use will keep plumbing lines clear and help maintain an efficient and sanitary environment. What kinds of cameras are used for inspections? Cameras can be utilized in many different areas such as sewer and drain lines, well casings, chimneys, vent pipes, crawl spaces, etc. The camera head is approximately 1.5 inches in diameter and can negotiate 45 and 90-degree bends in the 3-inch pipe. This versatile tool takes the guesswork out of diagnosing problem issues such as broken tiles and pipes, cracked chimney and boiler flues. Most access restricted areas can be easily inspected and video recorded for inspection and repair purposes. What are baffles? And what happens when they break? The purpose of tank baffles is to secure the waste solids which flow from the house. The solids then break down in the septic tank and only the water should leave the tank to be further treated in the (dispersal zone) drain field. Sanitary tanks are equipped with two baffles each. One baffle is at the inlet and one baffle is at the outlet. Many sanitary tanks are constructed of concrete. Due to the bacteriological process of breaking down the solids in the tanks, a corrosive gas is emitted. This hydrogen/sulfide gas can cause corrosion to the areas above the water line in the tank. This process is usually more severe on the outlet side of the tank to include the outlet baffle. When the outlet baffle is damaged or broken off, the solid waste from the house can flow directly to the distribution tank and or to the drain field. This can cause backups, ponding and severely reduce the life expectancy of the dispersal zone. AST, Ltd. has the staff to repair and replace your broken baffles. Are my manhole covers/risers up to Wisconsin code? 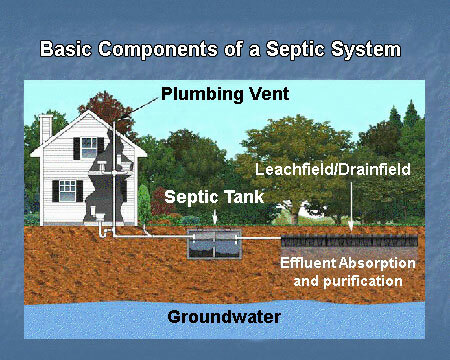 All sanitary systems are equipped with septic tanks. Some systems can have several tanks. Mound and at-grade pressure systems typically have two or more tanks. These tanks may come with risers (round rings, concrete or plastic) which allow the manhole cover to be brought to the surface. By Wis. Code, manhole covers must be either 2 inches above grade or 4 inches below grade and buried. Any cover above grade must be secured with a locking device (chain and lock) and warning label describing the dangers of entering the tank. Periodically the risers and covers will become cracked and worn. Leaks at the riser seams may cause groundwater infiltration. Your service provider should access the condition of the covers and risers upon visual observation and bring any defects to your attention. AST, Ltd. maintains a supply of risers and covers to fit most sanitary systems. Some buried covers can be raised to the surface to eliminate unpleasant digging. Cracked and broken risers can be removed and replaced to ensure the integrity of the sanitary system. How does an Aeration System work? An Aeration System has some similarities to a standard sanitary system. This system is used in areas where the soils are not ideal for filtration and treatment. An Aeration System will have the standard septic tank or tanks, sized for usage, and an aerator which pumps oxygen into the waste water to increase the bacteria. The bacteria consume the waste as a food source, clarifying the waste water in the process. 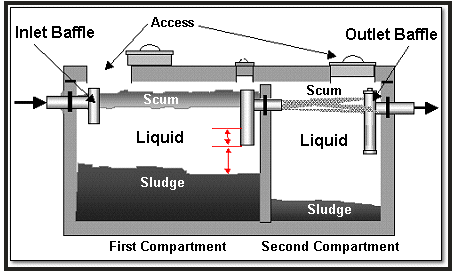 The waste effluent flows to a pump chamber to be distributed to the dispersal zone, (mound, at-grade pressure, etc.). Some systems can be more complicated with recirculating sand filters, Ultraviolet disinfectant lights, alarms, dosing timers, etc. Aeration Systems typically require yearly service and must have a Certified POWTS Maintainer secured to satisfy State/County inspections and reporting. AST, Ltd. has these professionals on staff to inspect your system. Need more help? Contact Arnold’s via email, call 1.800.994.0500 or start an online chat.